It was around ten p.m. eastern time on May 6 when even the most dizzying of sycophants at The Machine began to take stock. The merry time of misrule that was all the rage for close to two months was sounding taps from a distant bugle horn due south. The phones at the Bloomington, Indiana Headquarters of Clinton Central had gone silent, ceasing the mindless bustle and putting many on alert. Several of them had thought there had been a blackout, but the televisions above their heads continued to buzz the bad news from North Carolina. The mood, so full of helplessly false hope shoveled without shame by obvious psychopaths for weeks, now took on that of a cartoon character having realized it had wandered off the cliff and suddenly, in a rush of cold reality, glanced down to find the abyss. The unrecognizable stench of bitter and lasting defeat draped the air. And for the first time, deep inside the spectacular blanket of denial that had become Campaign Fantasy Camp, everyone understood the initiative had changed. Standing from his cubicle, headset still clamped to his head, the emotionally strained voice of an exhausted intern croaked, “What are we doing here?” No one, it turned out, had a serviceable answer. By dawn the gallows jabber of “being in the zone” and “downhill momentum” and “game-changing” appeared a sad joke in the unforgiving light of day. To those still left in “charity” employ of what one Clinton aid recently called The Three-card Monte of campaigns, “a dismal march of shameless pandering and sophistic photo-ops”, the jig was most agonizingly up. North Carolina, in play for days, turned into a Barack Obama landslide. Worse still, Indiana, the primary that was supposed to seal the “white working class” super-delegate deal for Madam Shoo-In, was at first too close to call and ultimately a few thousand tallies from scratch. Let it be known that it was the final razor-thin count in the Hoosier State that began to dismantle the Clinton Machine. Indiana, the historians will write, loosened the Clinton’s death grip on the Democratic Party. Those who had stood firmly behind their impenetrable wall to crash and burn reputation and treasure, started to awaken to their folly. So what is Hillary Rodham Clinton doing here? The Machine’s moneyman, Terry McAuliffe, giddy as a schoolgirl at 6 p.m. of the last election day that will matter to a Clinton in a very long time, had nothing to say to reporters by midnight. NBC’s Andrea Mitchell asked him how much money the New York Senator had left. McAuliffe looked at her blankly and stammered, “Money?” as if he had never heard of the word. The truth emerged twelve hours later. The Machine had officially gone belly up, and reports by late afternoon the next day had the candidate personally in the hole for over $11 million. All of her public office earnings spent on a random fling across key national election swing states downing whiskey shots, toting rifles, fitting for hardhats and telling the national press she was going to “obliterate Iran”. By the Sunday before the fateful vote, Clinton’s brandishing of the ill-conceived and badly argued Tax Holiday idea was so viciously pilloried by every known economist it appeared she had lost her grip on whatever authenticity remained viable. Hillary Clinton would have to come to grips with the annoying concept of fact. She is done, and has been for some time. She has been running from something, not towards it; and only what is left of her good name is being challenged, not Barack Obama or a long-shot chance at the White House. Word began filtering through the offices that Ms. Rodham cancelled her scheduled post-primary bookings on the Today Show and Good Morning America so she could “think out the strategy”, which was to focus on keeping the lions at bay, show no blood, and hitting her knees like Nixon and Kissinger during the eve of the Great Exodus. It wasn’t until cooler heads mapped out an Exit Strategy that things began to level. 1. No more vilifying ads or skewering depictions of the presumptive nominee. 2. Halting the ridiculous nonsense about having a chance to win anything by creating new and more bizarre routes and making up crazy rules to suit these pathways. 4. No more clamoring for debates, but they get to keep “challenging the system” to seat the delegates from Michigan and Florida, which will appear to the press and the American people like a populist charge to “bring true democracy back to The Party”, ending with the May 31 party caucus to heroically bring them back into the fold. 1. Allowed to play footsies with the Democrat base in West Virginia, Kentucky and Oregon for the next two weeks, talking proudly of “forging ahead” and “fighting on” bravely, but with an air of a farewell tour. 2. Have all outstanding debt erased by the liquid Obama funds and the committee coffers. 3. A formal and public offer of being on the ticket, which she will politely and officially decline, with the caveat that at least a dozen Clinton operatives get prominent posts on the Obama National Campaign Staff, and upon victory, several receive administration jobs. 4. 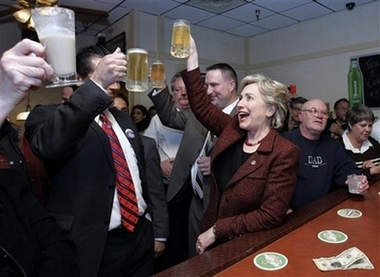 A smoothing over with party operatives, who have viewed for some time the Clinton Campaign as a kamikaze force trying to destroy Obama in the hopes there is a McCain victory in the fall and a To The Rescue Clinton Revival in 2012. There will be no mass shift in super delegates to seal Obama’s nomination until she officially and respectively suspends her campaign. On May 20, the day of the Oregon primary, which Obama is projected to win, Hillary Rodham Clinton will concede defeat, releasing her delegates, and appear magnanimous in the process. The Clintons get one last moment in the sun, and then will be asked to infiltrate the Reagan Democrat- white/male infrastructure of the party in Ohio and Pennsylvania, and rally the troops in the wounded Michigan and Florida delegations. Obama will paint the Clinton legacy with great pomp and humility, but look ahead to a new chapter in American history, thus separating his New Generation movement from the haggard remains of the Boomer nonsense that derailed what was once a well oiled, multi-million dollar political engine. If The Machine does not comply, the dwindling Clinton power base will be ignored and the candidate’s standing in Democratic Party good will, and therefore her lengthy career within it, is no more. Only time and actions will tell if The Deal was accepted in full or merely another con by the masters.